Group photograph taken at the presentation of awards and readings for the Walter Swan Trust Poetry Competition, Ilkley Literature Festival 2018 with judge Imtiaz Dharker. I was delighted to be commended and invited to read my poem. The poems are available on the Ilkley competition page. 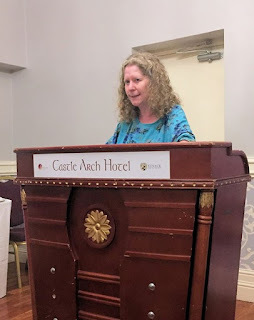 Another very successful and well-attended poetry festival in Bailieborough, the sixth consecutive celebration of poetry here which opened opened with a collaboration between artist Ruth McDonnell and LitLab writing group. The exhibition and festival were officially opened by Iggy McGovern. 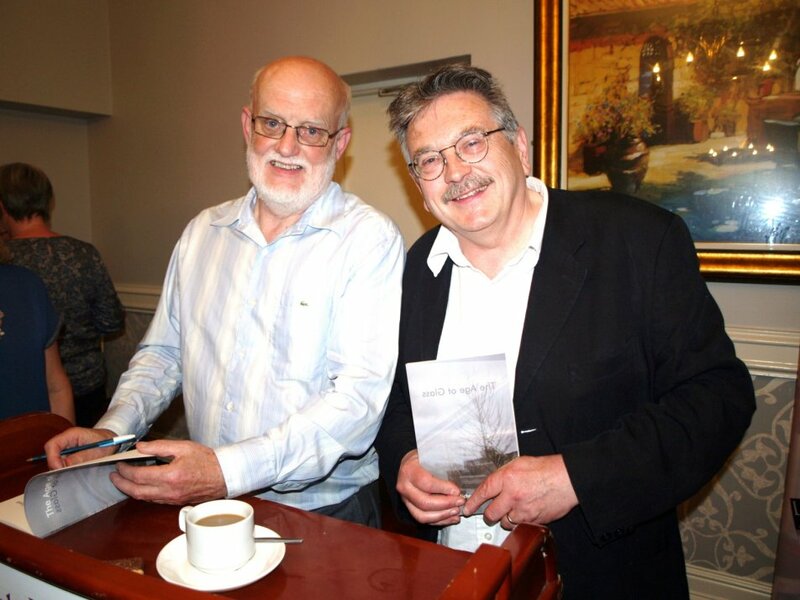 Poets Brendan McCann and Enda Wyley read on Friday night and enthralled the audience. An open mic followed. Saturday morning had workshops by Enda Wyley and AnneMarie Ní Churreáin. 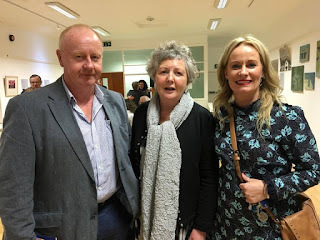 The afternoon saw the Irish Writers Centre launch their Poetry master class series. The launch included a reading by Noel Monahan who is one of the tutors. 1st ‘Shannon of the Eye’ Jane Burn, Co. Durham; 2nd ‘Illuminated Manuscript Trinity College Library 2016’ Glen Wilson, Co. Armagh; 3rd ‘Gently Pulling Two Pieces of Poorly Glued Paper Apart’ Jamie Stedmond, Co Dublin. The festival concluded on Saturday evening with readings by PJ Kennedy and Annemarie Ní Churreáin which were enjoyed by the large audience in Murtagh's lounge. Her “journeywoman” then is about the journey made by one woman and by many women, through childhood, womanhood and motherhood, towards mastery, enlightenment, maturity. The fifty poems which comprise this collection, Journeywoman, are snapshots taken on that journey. The volume is divided into four sections of unequal length. The first section is one of the longest. Manoeuvring is an unexpectedly delightful title for the section which deals with relationships; with mother, with husband, with son, with others. I like how we are gently invited to consider mundane common tasks and ponder possible deeper meanings without any sledgehammer language, any obtrusive signposts of the significant. Consider how in The Sewing Box the replacing of a broken button on a husband’s jacket cuff becomes such an important event and leads to such wonderful details and memories. And see how the repeated, almost off-hand, phrase, “No one will notice”, becomes so important at the end. Similarly in Folding the Sheets the details of the process become a sort of advance and retreat country dance which ends with the wonderfully evocative, “fold it crisply / into a perfect square”. We are left to imagine the identity of the other person, the precise relationship. Van Der Meer is good at knowing how much to tell us and how much trust to put in the reader. She is also good at including detailed descriptions, fooling us sometimes into thinking she is telling us everything. In Windows, Lesson at Masala Cooking School and in Homemade Pasta on New Year’s Eve for instance the great accretion of details still leaves central questions of relationships open to the reader’s probing. The second section Travelogue is the longest and there are accounts of incidents and thoughts arising from trips to Ireland, Italy, the Netherlands, France, Spain. There are poems which involve literary figures, Oscar Wilde’s stature in Galway and grave in Paris, the Brontes in Yorkshire and in County Down, Antoine de Saint-Exupéry, Calderón de la Barca, Lope de Vega, the portraits of writers in stained glass at the National Library, Dublin, and even Jim Morrison. Anyone who visited Yeats’ isolated County Galway tower can appreciate that first line of Visiting Yeats at Thoor Ballylee, “It was as though the world had stopped”. But the most impressive poems in this section may be the more personal ones, Buying Sandals in Oltrarno, where she gets herself “a pair of handmade / Roman sandals, the kind / in the children’s Bibles / her mother used to read”, and Leather Shop in the Via Francesco Crispi, where boots or shoes are purchased, “I settle on / burnt sienna you on lime green”. As elsewhere in the collection a raft of details are included but the reader is left to figure out exactly the relationship of the couple or the significance of the incidence. Have those solid Irish midland towns, Mullingar and Athlone, ever before figured at the start and ending of a poem? I doubt it. In Atonement the enigmatic journey begins “By Mullingar, we were through the worst of it” and ends “you took the exit for Athlone / before I could tell you / where to go”. The hint of “alone” in Athlone is great. Section three’s stark title, The Cancer Journey, points to a different, traumatic journey. These six poems are a multi-layered meditation of the treatment journey, the drugs and medication, the fear of relapse, a fellow-traveller who did not survive and the scars left behind by the disease and the treatment. The first poem in this sequence, ABVD, deals directly with the 4-drug combination used in the chemotherapy treatment by naming each of the drugs and meditating at length upon it, its name, origins, history, effects on the body. “Vinblastine sin blasts me / my silent joke, never spoken / another colourless poison / first isolated by men called Noble and Beer / names unlike their protégé, found / in a Madagascar periwinkle plant / so pretty and exotic / so nasty and toxic”. There is no sugar coating here, no poetic softening of the reality. The poem ends with a simple plea: “ABVD me / back to life”. The final section of eight poems entitled Fellow Travellers has poems about women, some named, some well-known, others not well-known, some anonymous. These include Emily Bronte, Saint Agnes and Lady Bathe who is interred with her husband, Sir Lucas Dillon in Trim, Ireland in a tomb known as “The Tomb of the Jealous Man and Woman”. There are two poems in this section concerning the issue of Muslims in Canada, particularly Quebec, with reference to the Reasonable Accommodation debate. The first, The Philosophy of Hijab is in the voice of a Muslim female and the second, Prayer on a Train, describes an encounter with a Muslim originally from Iraq, who prays on a train. It ends with a thought: “I realize she is more / sure, praying on a train / in a foreign land / than so many of us at home”. The collection ends with a four-section meditation on the nun, Jeanne Le Ber, described as North America’s First Recluse who lived in Ville-Marie which later became Montreal. This was as a result of the poet’s retreat in the convent in which the recluse had lived. The silence, the meditation has such an effect on the poet that in the last stanza the poet and the recluse have become one and the ending could apply both to the art and craft work of Jeanne and to the work of the poet: “God willing the images I stitch / will stay”. So Carolyne Van der Meer’s Journeywoman ends where all journeys end, with the hope that something will remain, some scrap of memory or image or writing to outlast the life. The book is beautifully produced and edited by the Canadian publishing house, Inanna, whose mission is to publish a multiplicity of voices, particularly fresh new Canadian voices, that speak to the heart and tell truths about the lives of the broad spectrum and endless diversity of Canadian women. This volume certainly fulfils that promise. The cover is especially striking and features a specially created painting by the Montreal artist, Ariane Côté, also entitled Journeywoman. Canadian poet, Carolyne Van Der Meer, has just had her poetry collection, Journeywoman, published by Inanna Publications, Toronto. Carolyne has been published in many Irish journals including our Boyne Berries and she attended the launch of Boyne Berries 10 while visiting Ireland in 2011. She is the author of Motherlode: A Mosaic of Dutch Wartime Experience, which was published in 2014. "Journeywoman is the story in poems of the explicitly female journey made by women through girlhood, motherhood and beyond. The play on the word journeyman is intentional with the notion of completing an apprenticeship and seeking mastery of the trade implicit. This unique collection explores the stages of womanhood as defined by this author: the waif, the mother and the crone. It invokes the stories of many to describe the process of mastering the craft of being female, with all its inherent complexities. The journey involves not only the physical alterations a woman undergoes through the changing of stages—the metamorphosing required to achieve mastery—but also true travel, the road embarked upon to achieve enlightenment, the attempt to grasp the intangible, the ethereal, the metaphysical, the disembodied, the sacred." More on the Inanna website where you can also order a copy of the collection. I'm delighted with this very careful, complimentary and insightful review of my latest collection, The Age of Glass, by Colin Dardis on the Lagan Online website. "Usually, it’s easy to spot the filler in a collection, the poems that could have benefited from a good editor, or just shouldn’t have made the cut. There’s none of that here: in each poem, every line speaks to every other line, concrete, essential and assured of its direction and purpose. Perhaps overall, it is the power of death that is given the most reverence within, its touch seen in others, felt too close. And yet of the call to rage against that dying light, Farry tells us that death is to accepted; the wearing of a crucifix is “gentle on my neck, | the body no extra burden”. With touches of dark humour, knockout phrases and overwhelming poignancy, Farry has truly delivered a contender for book of the year here, and one hopes that there will be more to follow soon." 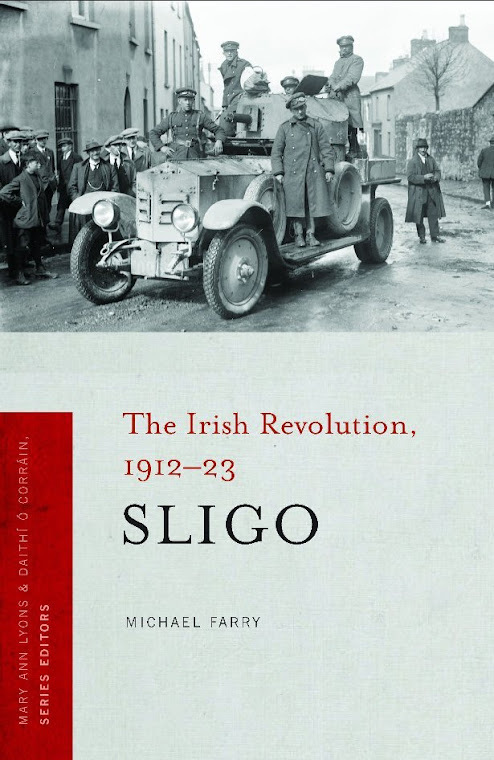 I'm delighted to have an article on the War of Independence in County Sligo in the Atlas of the Irish Revolution, just published by Cork University Press. 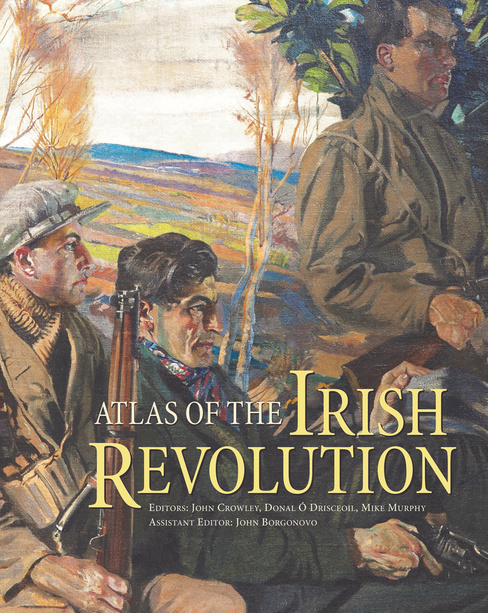 This is a huge volume of almost 1,000 pages, written by the leading historians, geographers and literary scholars of the Irish revolutionary period. This work, with its authoritative texts, superb photographs, informative maps and its reproduction of key documents, promises to be the outstanding publication of the ‘decade of commemoration'. To have a look inside the book go here. A Sunday Business Post review here. Bailieborough Poetry Festival details online now. 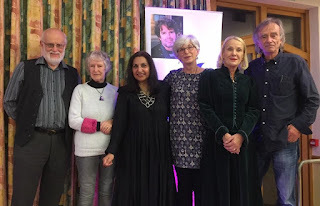 A great line-up of poets from Ireland, the UK and the USA, including Noel Monahan, Patrick Chapman and Gerard Smyth, American poet Linda Opyr and Emily Wills from the UK. The festival takes place Thursday - Saturday 5 - 7 October 2017. Details of the poetry competition are also online. Judge this year is Patrick Chapman and the closing date is Friday 2 September. 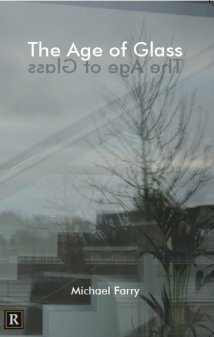 My second poetry collection, The Age of Glass, was published by Revival Press, Limerick, Ireland in June 2017. The design and cover image is by Lotte Bender. The collection contains a total of 63 poems grouped in five sections, the last of which is "Gerontology". Dominic Taylor of Revival Press and myself at the launch. The Trim launch of the collection was held on 8 June at 8pm in the Castle Arch Hotel, Trim. 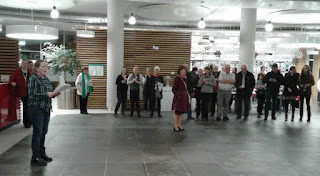 Nessa O'Mahony, poet and teacher, officially launched the collection. Nessa and Iggy McGovern kindly read the collection and offered comments which appear on the back cover - extracts below. I attended workshops by Nessa and Iggy and poems which developed from each workshop are included in the collection. Revival Press is a community publishing press and is the poetry imprint of The Limerick Writers' Centre. It was founded by managing editor Dominic Taylor in 2007. 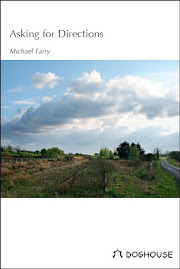 It has published over thirty poetry titles to date plus three anthologies including I Live in Michael Hartnett. Revival has also helped establish a number of local and national poets by publishing their first collections. One of the aims of Revival Press is to make writing and publishing both available and accessible to all. It tries as much as possible to represent diverse voices and advocates for increased writing and publishing access to individuals and groups that have not typically had this access. The collection, 12 euro, can be purchased from the Limerick Writers Centre website of using the PayPal link to the right. 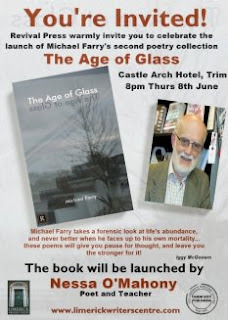 Trim Launch of The Age of Glass. The launch takes place in the Castle Arch Hotel, Trim at 8pm on Thursday 8 June. Everyone is welcome. 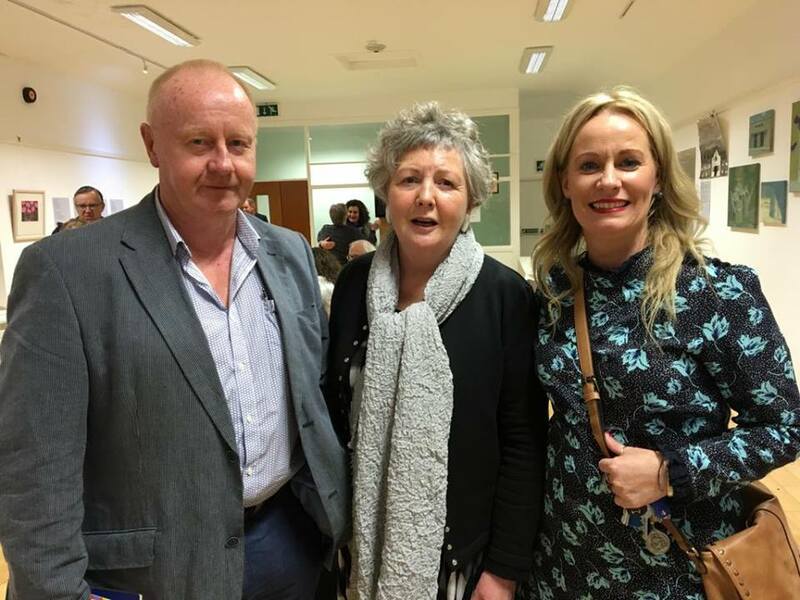 I'm delighted that well-known poet and teacher, Nessa O'Mahony, is officially launching the collection. For this Mothers Day. This poem will appear in my second poetry collection, due out in May. Knocknashee is the mountain in south Sligo which appears in the image above. The poem was written as a result of this November climb. We picked the perfect weather. left by cemetery or railway station. wished you were there beside us. You were there beside us. I'm delighted to end 2017 by having a poem included in "The 12 Poems of Christmas" on the Lagan Online website. Thanks to Lagan Online Editor, Colin Dardis. Congrats to Colin also, his collection is to be published by Eyewear Publishing in the near future. The collection is available as a free pdf download at the link above. Happy reading! 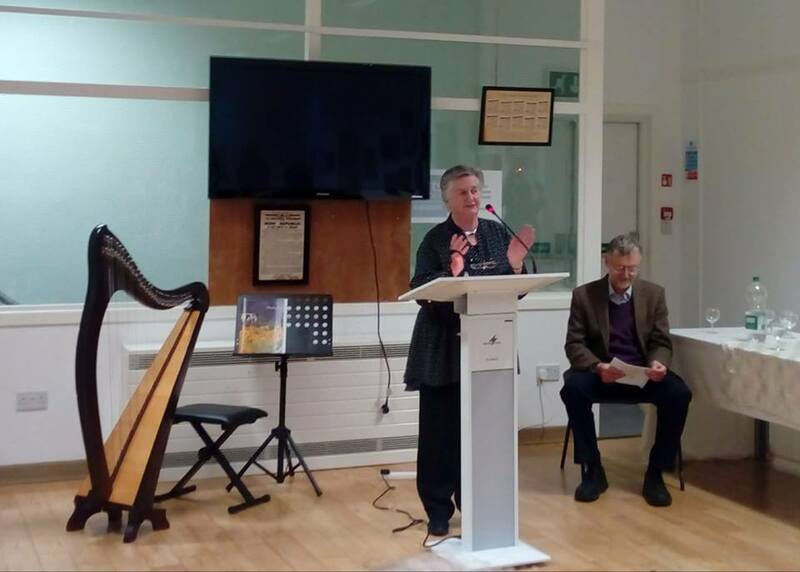 On Friday 11 November Rath Chairn Library Art Group launched their "From Tara to Beyond" exhibition in the OPW building, Jonathan Swift Street, Trim. We in Boyne Writers Group were invited to submit poems to the group which the artists used as inspiration for paintings. We were delighted to be involved in this and were delighted to see how the artists interpreted our poems. The exhibition continues in the OPW building during normal office hours until the end of November. Well worth a visit. Treasa Uí Mháirtín officially opening the exhibition. 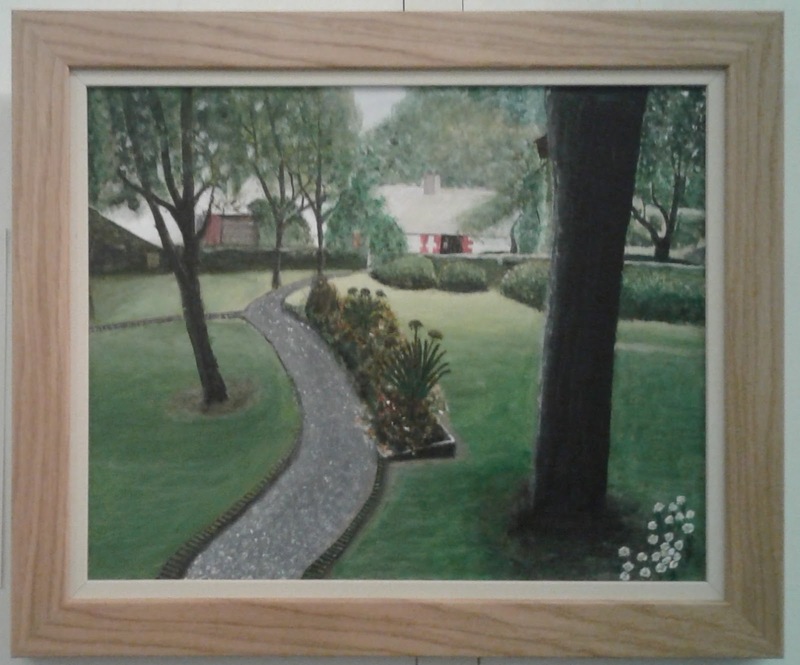 Two painting by Treasa Uí Mháirtín in response to my poem "Dividing Hostas". 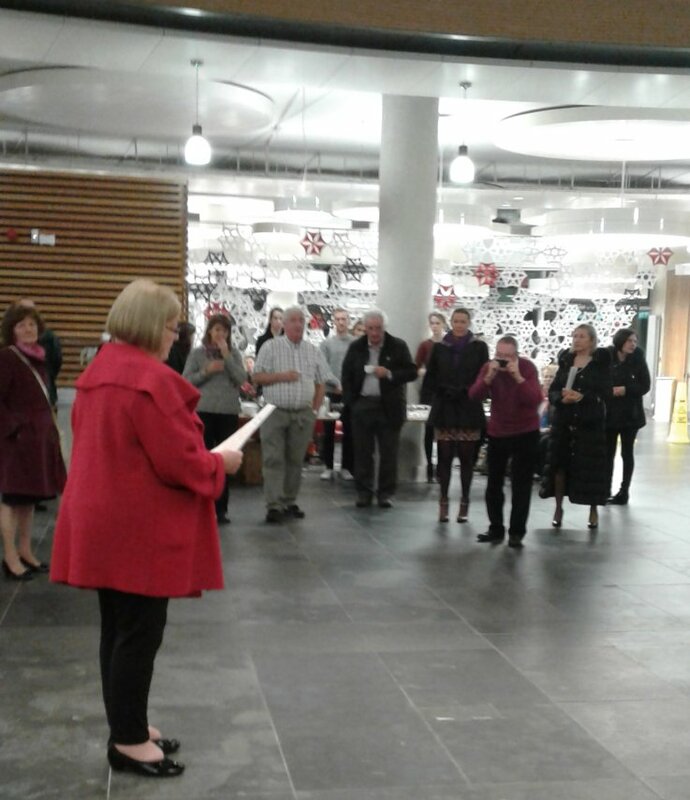 Orla Fay reading her "Tara" poem at the opening. 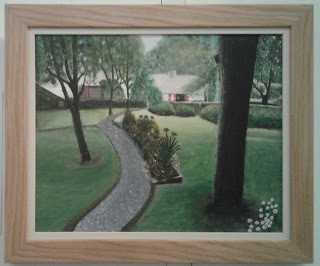 "Ledwidge's Cottage, Slane" by Frank Fagan in response to Sinéad MacDevitt's poem of the same name. Two paintings by Michi Nagoo Smith in response to Anne Crinion's poem "A Changing Trim". I've had poems accepted in some journals and anthologies recently. 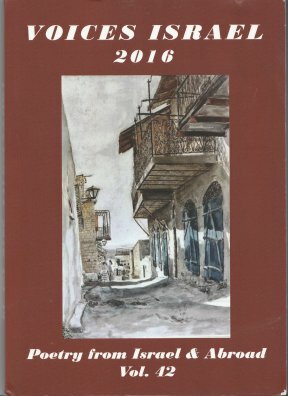 Two poems, Cicades at Nages and Secret were published in the Voices Israel Anthology 2016. Poets from all over the world are included in this180 page volume and I'm delighted to be one of two Irish included. Two poems, Phone Call and We Are All Refugees, were also accepted by Acumen Journal (UK) and published in issue 86, September 2016. They also included one of these poems, We Are All Refugees, as a guest poem on their blog. Antiphon online journal published my poem Clarification in issue 19 and also included an audio file of my reading of the poem on their blog. The Honest Ulsterman online journal published my poem, Where I'm From, in their October 2016 issue. 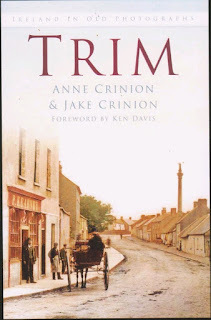 Trim by Anne and Jake Crinion - A new book. 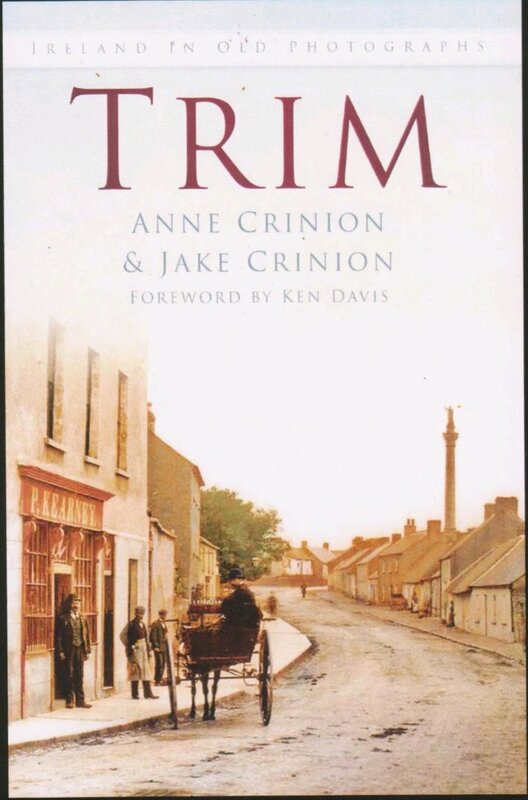 This new book, Trim, by Anne and Jake Crinion, will be launched on Thursday night next, 10 November at 8pm in the Trim Castle Hotel. The book is published by the History Press in their series, Ireland in Old Photographs, and I have been asked to perform the official launch. As a blow-in to Trim (1970), I feel honoured to have been asked. From the back of the 122-page book: "Founded in the fifth century and nestled on the banks of the Boyne, the historic and picturesque town of Trim has a rich and vibrant history which is uniquely captured in this collection of archive images. Many of the photographs were taken by Anne Crinion, a freelance photographer for many years. Featuring local landmarks, people and snapshots of ordinary daily routines, each accompanied by a detailed caption, they portray the development of the town and show how life here has changed over the years".